There was certainly none in Columbus Friday night after the Boone Central/Newman Grove Cardinals scored an emphatic 35-7 victory over host Lakeview in a Class C1 contest between teams ranked #3 and #4 in the Omaha World-Herald. 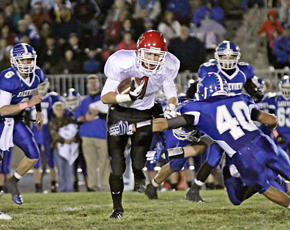 BC/NG also earned the C1-5 District championship with the win and secured a berth in the 2012 state playoff field. It was difficult to find just one key to the Cardinal triumph. Boone Central/Newman Grove was that dominant. Offensive and defensive fronts that controlled the line of scrimmage. A defense that stymied a prolific Lakeview attack. Quick-strike plays and clock-chewing drives by the offense. Heroics from senior QB Tanner Mazour, who rushed for 184 yards – including 34 and 45-yard TD jaunts – and passed for another 97. An all-around performance that certainly pleased Cardinal Coach Arnie Johnson. “Our defensive coaches had a great plan, and the talent of our players made it work,” Johnson praised. “Lakeview was scoring 41 points a game and we held them to 7. Amazing! “We were able to make more big plays than a team that lives on big plays. The real key offensively was the play of our line. Our guys up front, along with some powerful running from our backs, made it very difficult for Lakeview to stop our basic plays. They had to put eight guys up close (to the line) and that allowed us to gash them with some big running and passing plays. The early minutes of the contest looked like what most fans expected of a clash between highly-ranked teams. But as the first half wore on, Boone Central/Newman Grove began to assert control. The Cards scored first, a Mazour to Tyler Hedlund pass carrying to the two-yard line and Blake Slizoski barreling into the end zone on the following play. Lakeview responded quickly, Ethan Scheffler juggling and catching a deflected pass, then outracing the BC/NG secondary to complete a 65-yard scoring play. From there – all Cardinals. On BC/NG’s ensuing possession, Mazour hit aerials of 21 yards to Derek Gentrup and 19 to Garrett Temme, then bolted 34 yards nearly untouched on a QB draw to put the Cards ahead 14-7 with 2:26 remaining in the first quarter. Boone Central/Newman Grove took much of the steam out of the Vikings in the second quarter, mostly with a withering 99-yard, 17-play drive during which no gain exceeded 12 yards while consuming 8:47 of clock time. Mazour capped the march with a one-yard plunge to give BC/NG a 21-7 halftime lead. The Cards’ senior leader doused most of Lakeview’s remaining hopes quickly following intermission. On the third quarter’s first play from scrimmage, Mazour broke free on a 45-yard TD gallop and the game’s conclusion was basically foregone from there. Sophomore Wyatt Mazour added an 11-yard touchdown run with 2:28 remaining in the third period and the stout Cardinal defense continued to shut down the hosts to the final whistle. A dominant performance and a season goal accomplished. But unfinished business remains. “You always want to win the district, but we’ve got higher expectations than that,” Johnson stated. “We’ve got to just go one game at a time and go from here. One of our goals was to win the district and we got that done.